Open sources front-end for CPCEmu image-Disks. ... a MIA Computer ! R.I.P Or alive ! The fabulous machine ! MIA on a hard disk... Rescue in progress !!! -> QuickSilva HRG BMP converter. * Something to do ... in Paris. * Something to do ... in Time. * STAR TREK, the last battle. Multi-machines DskCenter disk image viewer. UDG tool to easy build and redefine grafics characters. * Sc-3000 & Sf-7000: Z80 disassembler. * Ordi-5 : Scans/programs typed in/Web-Master. “Jeu du taquin”, Puzzle game for win32 in Visual Basic. After playing alone or on line ... try to finish to code this game! Mess's Help ... Faq, advices to use and configure this emulator. Download page : Many files to custom and personalized Mess ... and more ! 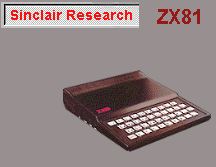 Le Zx81 : Description technique. Bad News ... News of attics emulators !